Alain Resnais’s Muriel, or The Time of Return, the director’s follow-up to Last Year at Marienbad, is as radical a reflection on the nature of time and memory as its predecessor. 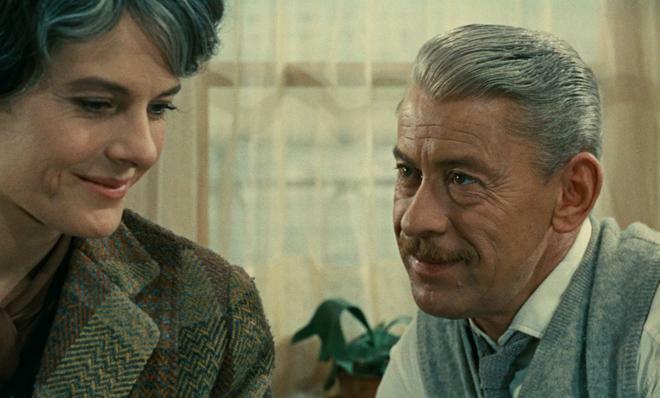 The always luminous Delphine Seyrig stars as an antique shop owner and widow in Boulogne-sur-Mer, whose past comes back to haunt her when a former lover reenters her life. Meanwhile, her stepson is tormented by his own ghosts, related to his service in France’s recently ended war in Algeria. Featuring a multilayered script by Jean Cayrol, and inventively edited to evoke its middle-class characters’ political and personal realities, the fragmented, emotionally powerful Muriel reminds viewers that the past is always present. Using specific tricks of coverage and editing, many movies go out of their way to promote the illusion of real time on screen. As we cut from a close-up to a medium shot to a wide master, directors can assemble different angles and takes to create an almost invisible montage, mimicking the natural linear flow of reality so seamlessly that audiences never see the cinematic stitching holding it all together. The films of Alain Resnais, however, are an entirely different matter. Frequently eschewing standard rhythms in favor of more abstract experimentation, the director often uses overt editing techniques to deliberately manipulate the passage of time and space on screen -- and his 1963 film, 'Muriel, or The Time of Return,' is a perfect example of this style. Marked by an innovative, fragmented structure, the movie examines lingering traumas of the past through a present cast in constant disarray. The story follows Helene (Delphine Seyrig), the owner of an antique shop in Boulogne, France. When she is visited by an old lover, Alphonse (Jean-Pierre Kérien), the pair attempt to recreate their former romance. Meanwhile, the woman's stepson, Bernard (Jean-Baptiste Thiérrée), deals with mounting guilt stemming from his actions during the recent Algerian war. As confessions and revelations are made, bygone memories and recent choices are shed in a new light, causing schisms between relationships -- both newly burgeoning or on the verge of being rekindled. Can we ever truly recapture the essence of the past? Or conversely, can we ever truly heal from its enduring pains? And with spectral memories constantly informing our present day realities, is it ever really possible to fully connect within the here and now? These are just some of the questions and deeper themes at work throughout 'Muriel,' fueling a fairly enveloping drama about guilt, regret, detachment, and deception. With that said, the narrative itself isn't really what makes the film so uniquely involving -- it's how that narrative is presented through Resnais' intentionally jumbled form that makes it all so memorable. Reinforcing the story's fascination with time and disconnected relationships, the director employs a uniquely fragmented structure, frequently avoiding typical editing rhythms. To this end, Resnais uses jarring cuts, mismatched static shots, and time jumps to disjoint and abstract an otherwise linear progression. For instance, we may first see Helene welcoming guests into her home, only to then abruptly cut to several minutes later with the group already in the middle of their meal, only to then tersely cut again to the woman and her stepson in mid-conversation in the kitchen. Instead of gently guiding the flow of time by letting sequences play out, Resnais often forcefully thrusts us forward, creating deliberately disorienting gaps between shots and scenes. And while the first act occurs over just one night, the movie's mid-section takes these temporal cuts even further, offering a few extended montages filled with quick, seemingly random shots and lines of dialogue that represent small moments, sometimes over a series of days. In one fleeting shot we could see Bernard saying hello to his girlfriend, while the next might feature Alphonse having a drink in a café, and the next could see Helene and Alphonse talking in a car, and so on for several minutes. One second characters might be angry at each other and the next they might be laughing, skipping ahead in the story with the film's cinematic seams clearly on display. Taken on their own, these fragmented moments might not mean much, but as the film piles them on top of one another they start to form a carefully constructed narrative -- one where the divided passage of time begins to parallel the characters' own internal and external struggles with lasting connections. These innovative manipulations in time are also joined by notable disruptions in space, with Resnais frequently cutting between purposefully inconsistent shots and angles. One scene focused on an argument between Helene and Alphonse is a perfect example. As the pair's anger hits a fever pitch, the scene abruptly cuts across the 180-degree line, leading to a new disorienting angle where the characters' positions no longer match up with the orientation presented previously. Likewise, a later scene features two separate conversations -- one between Alphonse and an acquaintance and one between Bernard and a friend. As the duo's converse, we cut between single shots of all four characters with little regard for who is actually speaking to whom. Alphonse might say something to his friend only for us to then transition to a shot of Bernard responding to his companion instead -- all enhancing the film's sense of confusion and doubt. Experimentations in audio is also peppered throughout the runtime, including a frequent use of pre-lapped and post-lapped sound, allowing dialogue from one scene to carry over onto images from the next -- once again blurring the line between different times and locations. The film's operatic score also works to further its unconventional tone, using overly dramatic music cues to punctuate key lines and seemingly mundane events, revealing uncertain implications and hints toward deeper secrets. And when those secrets are finally exposed, the story concludes with a satisfying yet still inherently ambiguous finale. Though not quite as groundbreaking or affecting as 'Hiroshima mon amour' and 'Last Year at Marienbad,' 'Muriel, or The Time of Return' serves as a worthy and appropriately innovative follow-up to the director's preceding experimental masterpieces. Once again elaborating on Resnais' fascination with memory, the film's deliberately fragmented editing techniques create a fractured rumination on time forever struggling to reconstruct itself. Criterion presents 'Muriel, or The Time of Return' on Blu-ray in their standard clear keepcase with spine number 824. The BD-50 Region A disc comes packaged with a pamphlet featuring an essay by film scholar James Quandt. The movie is provided with a 1080p/AVC MPEG-4 transfer in the 1.66:1 aspect ratio. Taken from a 4K restoration of the 35mm original camera negative, this is a very impressive and seemingly authentic picture. The print is in great condition with a light to moderate layer of natural grain and no notable signs of damage, giving the image some pleasing filmic texture. With that said, there are a few fleeting shots that look like they come from a lower quality source. Clarity is nicely rendered with strong fine textures visible, including the tiny patterns on Alphonse's coat and individual strands of Helene's graying hair. The color palette veers toward a faintly rustic look with an emphasis on warm yellows and browns, along with rich splashes of red and blue. White levels are balanced well with solid contrast, but black levels are a hair elevated. Free from any troublesome processing or major age-related issues, this is a great transfer, preserving the film's unique aesthetic well. 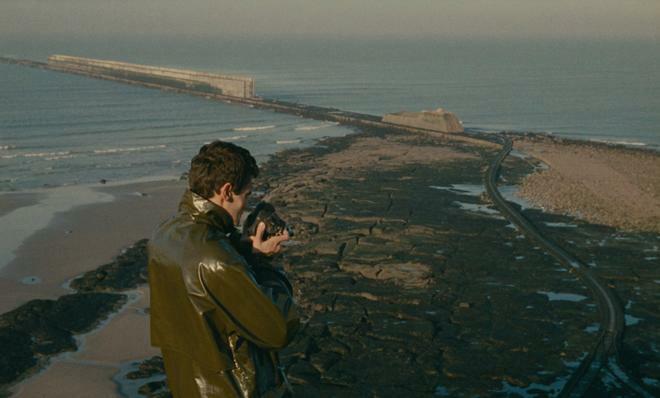 The film is presented with a French LPCM Mono track and optional English subtitles. With a few unconventional sound design and music choices, the audio deliberately complements and contrasts with the visuals in interesting ways. Dialogue is clear and clean throughout with no balance issues or age-related flaws. The overall track seems to be mixed a little low compared to most other releases, however, causing me to raise the volume a bit more than usual. Though modest, general ambiance is handled well and Resnais emphasizes certain effects (the sound of chips being eaten, for instance) in key scenes to heighten the mood. Likewise, the director makes great use of pre-lapped and post-lapped audio, carrying certain conversations and lines of dialogue onto other scenes and shots. Dramatic music cues and operatic arias feature solid range and fidelity, filling the score with an atypical rhythm that bolsters the fragmented nature of the editing. With that said, the high frequencies can sound slightly strained. Artistically designed and technically proficient, this is a strong mono track for its time period. 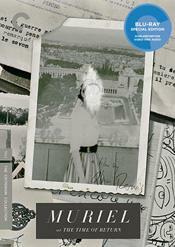 Criterion has put together a solid assortment of supplements, including several interviews. All of the bonus features are presented in 1080p with Dolby Digital sound and English subtitles for the foreign language portions. Une approche d’Alain Resnais, révolutionnaire discret (HD, 5 min) – This is an excerpt from a 1980 TV documentary about Alain Resnais featuring writer Jean Cayrol. Cayrol discusses Resnais' approach to filmmaking and elaborates on their working relationship. 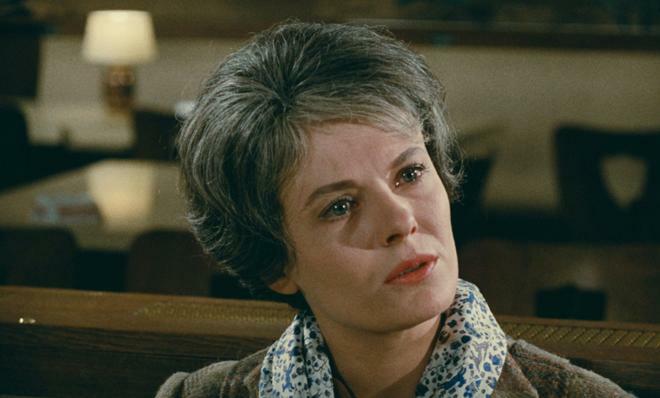 L'invite du dimanche (HD, 4 min) – Here we get an excerpt from a 1969 French program featuring an interview with actress Delphine Seyrig. The film's star addresses the differences in approach used in 'Muriel' compared to the director's previous feature, 'Last Year at Marienbad,' as well as how she went about playing an older character. Discorama (HD, 4 min) – This is an excerpt from a 1963 episode of the French show with composer Hans Werner Henze. Henze reveals how he got involved with the film and elaborates on the score's operatic style. Francois Thomas (HD, 27 min) – This is a 2016 interview with the film scholar. Thomas discusses the film's genesis, its Algerian war commentary, the writing process, structure, fragmented editing, visual style, cast, locations, and unconventional music -- offering a fairly comprehensive analysis of the production. Alain Resnais' 'Muriel, or The Time of Return' is an innovative examination of time and memory cast through an intentionally fragmented structure. The video transfer is fantastic and the audio mix is very solid. There aren't a ton of supplements included, but the interviews and analysis offer several worthwhile insights about the movie's production. The film's experimental editing style won't be for all viewers, but for those open to more unconventional forms of cinematic storytelling, or for those who are already fans of the director's other works, this is an easy recommendation.